1. Tabanidae flies are the largest of blood sucking flies, there are approximately 4,500 species found world wide, 30 of which can be found in the UK. 2. Adult flies feed on nectar but as a haematophagous fly the female horsefly feeds on blood to obtain the necessary nutrients for the development of their eggs and they will attack a wide variety of animals including horses and their human handlers. 3. 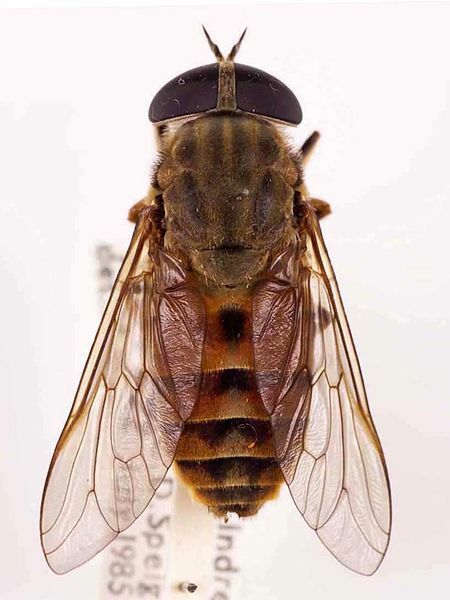 The horsefly (genus Tabanus) bite is very painful as the female horsefly cuts and rasps the skin with powerful mandibles and maxillae to create a feeding hole. The blood is sucked using a protruding hypopharynx which causes pain to the host. 4. Tabanids can take up to 300ml of blood a day from a host severely weakening the animal, they are also known vectors for blood- borne diseases such as Equine Infectious Anaemia. Horse fly bites are nasty resulting in lumps with a characteristic central ulcer. They can become infected. 5. Horsefly larvae inhabit moist areas feeding on invertebrates like snails and worms before they pupate. The adult horsefly emerges in June and July, the greatest horsefly activity occurs on warm, sunny days when there is little or no wind. 6. Insecticides containing pyrethroids (Permethrin or Cypermethrin) offer horses some protection against horse flies. Also consider stabling your horse on warm, sultry days when horse flies are active, horse flies don't like dark areas and will not go into the stable. 7. To avoid being bitten yourself, wear long sleeved tops, apply a repellent that contains diethyltoluamide (DEET) and wear light coloured clothing which apparently doesn't attract the flies like darker colours.